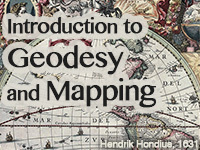 This lesson covers the topics of geodesy, datums, map projections, and map coordinate systems. Geodesy addresses the shape of the earth: the topographic surface, geoid, and best-fit ellipsoid. Datums addresses the position and orientation or the best-fit ellipsoid and the resulting coordinates. Map projections addresses the different ways to project an ellipsoidal datum onto a flat surface. Each projection has unique properties and each has pros and cons. Coordinate systems addresses the different ways that a rectangular coordinate system can be superposed on latitude-longitude graticule. All of the information was interesting and I definitely learned a lot. However there needs to be videos where we are walked through reading the different kind of maps. We were told what all of the different things meant on the map but never shown how to properly read one or write out the coordinates for a specific point. It was quite frustrating. Although the material is difficult to grasp, it is well presented for someone who has no prior Geodesy/mapping knowledge. I feel that the multimedia presentation is best used in conjunction with the text-based version for best understanding of the material. In my case, I was unable to use the multimedia presentation due to computer configuration issues. geodesy and mapping, helps us how to see the figure and magnitude of the earth. Its very informative and easy to understand. How things are described here is far more easier than how we think things should be. Me gusto la experiencia aprendí bastante, tengo estudios de mapas pero solo lo básico. buen contenido viene a reforzar los conocimientos para la navegación. It is very interesting to learn. A really clear and thorough presentation of often confusing material. The map projection section alone is well worth doing. Very difficult but of great importance the increase of knowledge. Very interesting and complex at the same time. The animations of selected graphics enhanced the ability to grasp the concepts. ME PARECIO UN EXELENTE TEMA Y ENFOCADO PARA LA ENSEÑANZA! This lesson needs a different interaction with media content. Describe the characteristics of height systems (e.g. dynamic, orthometric and normal heights). Differentiate between gravity related and ellipsoidal height. Explain how the Earth is measured and the importance of distinguishing the difference between datums. Explain a generation globe, scale factor, and convergence. Explain principal and actual scale (and differentiate between them) and how scale varies on a projection. Explain the three types of projection (gnomonic, Orthographic, and stereographic). Explain standard line, great circle, and rhumbline. Explain secant and tangent case projections. Explain the more commonly used projections and why. Provide examples.